Product prices and availability are accurate as of 2019-04-17 00:11:15 EDT and are subject to change. Any price and availability information displayed on http://www.amazon.com/ at the time of purchase will apply to the purchase of this product. ?Are you looking for a spacious beverage center when friends and relatives drop by to serve up some refreshing cold drinks?? 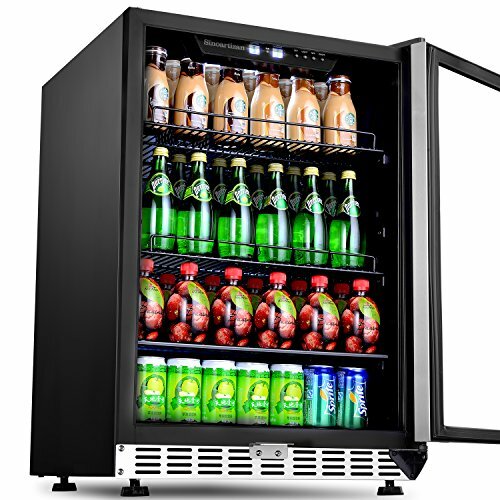 Sinoartizan Beverage Cooler is always a good idea for you! 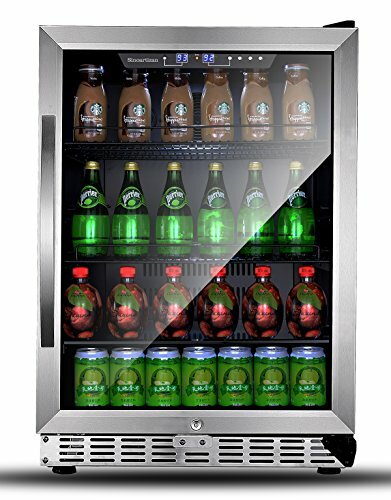 Upgrade your home bar, office or man cave with this convenient, freestanding or built-in beverage cooler. The sleek design looks great anywhere and provides instant storage for all of your entertaining needs - no fancy installation or kitchen renovations required. This beverage refrigerator features 2 different shelves ( 1* Tempered Glass Shelves + 2* Wire Rack ) that can be removable and rearranged to allow you to customize the interior storage to hold just the right combinations of bottles and cans, so you'll always have the perfect drink ready for your guests. 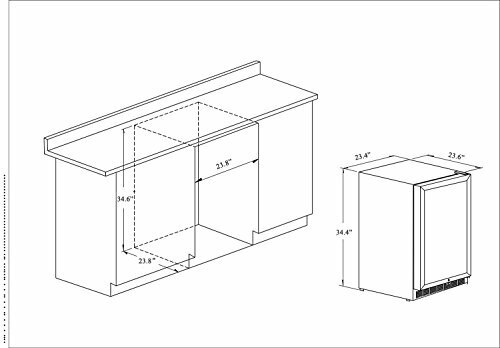 ?Suggested Built-in Dimension: W23.8" x D23.8" x H34.6"
?LARGE CAPACITY ?COMPACT SIZE: 11.03 cubic foot spacious beverage center holds up to 154 cans(330ml/can), perfect for your favorite beverages, coffee and beer collections. Takes just W23.8 x D23.8 x H34.6 inches of space, can be installed under a counter in kitchen or bar area, or used as a freestanding unit, adds elegance and function to your entertainment area or kitchen! ?TRIPLE-LAYERED EVIRONMENTAL LOW-E GLASS DOOR: Low-e glass door belongs to the environmental material, it can effectively reduce the energy consumption and harmful gas emission, plus the triple layers configuration can protects your collection from UV better , stabilize temperature levels inside and keep glass from fogging. ?POWERFUL?LOW VIBRATION COOLING SYSTEM: The low vibration compressor maintains 33-64°F temperature longer for both your wine and beverage collection, with fewer stops and starts! It won't disrupt the ambiance of your kitchen or your home bar area! The sleek stainless steel frame can highlight your beverage collection in any room of your home, the interior cool white LED light helps you easily to find a drink at night. ?INTERAL FANS?REMOVABLE SHELVES:Equipped with the internal fans, circulate air throughout the unit to provide even cooling and faster coldown,it is the 25% more energy efficient design that will save you money each month. 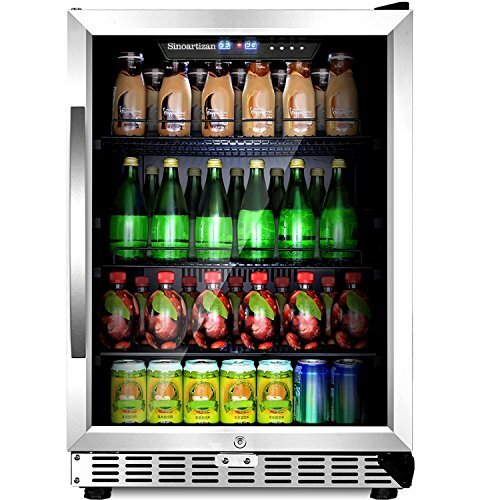 And there are 3 shelves(1* Tempered Glass Shelves + 2* Wire Rack) equipped in the cooler, which can be pulled out to make for easy loading and unloading the beverage. 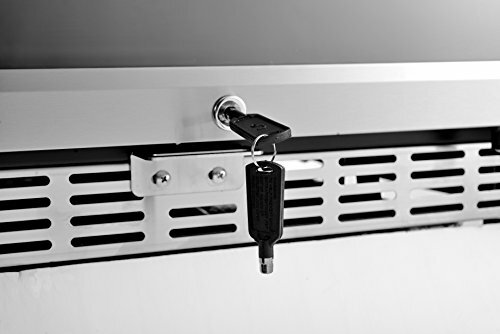 ?BONUS FEATURES AND SATISFIED CUSTOMER SERVICE: Safe lock design helps the children keep far away from the appliance. The morden push button temperature control with blue LED digital readout, makes it easy to control and check the temperature. Any further information needed before purchasing or aftersales service, you could contact us at sales01@sinoartizan.com.